We’ve always had enormous fun on previous visits to Discover; exploring the creative indoor and outdoor play spaces, participating in story builder sessions, doing crafts and taking in the special exhibitions. 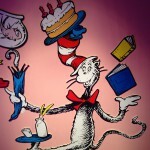 Having closed in April for refurbishment, Discover has now expanded its imaginative Story World onto an additional floor, added a new café and is re-opening on Saturday 23 July with a brand new Dr Seuss exhibition aimed at the under 7s. We jumped at the chance to have a look around this week. MJ and G are both fans of the Dr Seuss books and were instantly drawn into the immersive world that Discover has created based on The Cat in the Hat, The Lorax, Green Eggs and Ham and Oh, The Places You’ll Go! 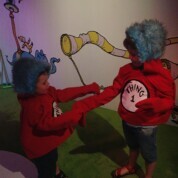 The boys played in a Cat in the Hat house, dressed up as Thing 1 and Thing 2, rolled noisy green eggs down a mountain and had fun playing music with the Boom Band (by tapping illustrations on the wall). You don’t need to have read the books to enjoy the exhibition – the games, caves, wagon, houses and dressing up will spark any child’s imagination. Upstairs, the Discover Story World has been re-imagined and revolves around resident space alien Hootah and his quest to collect stories. You can spot Hootah as you travel around the magic forest, visit a castle and make the sleeping dragon stir, dance in a disco cave, captain a sailing boat, post your story in the story sorting office and go upstairs to visit the Observatron. As you tour the Museum you can also spot your favourite storybook characters in new works of art created by top illustrators such as Axel Scheffler, Korky Paul and Chris Riddell (the boys were particularly delighted to spot their favourites: The Gruffalo and Winnie the Witch). 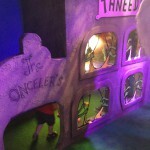 Head outside to slide down the Monster’s Tongue in the Story Garden, be a pirate or play giant musical instruments. 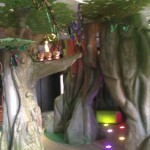 If you have imaginative, story-loving children, this is the ideal place to go for a half-day trip during the school holidays. MJ and G have already asked when we are going back. Discover opens on Saturday 23 July 2016 and is open daily during school holidays. Admission costs £6.50 per person (children under 2 free) – family tickets and concessions for Newham residents are available. 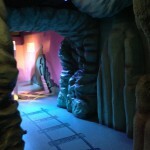 Entrance to The Fantastic World of Dr Seuss is included in admission, but you should book your session in advance to avoid disappointment as places are limited. There are also story builder sessions for toddlers (0 to 3 years) running throughout the summer holidays, based on Dr Seuss’s Mr Brown Can Moo Can You? Discover has opened a new, bright and airy café, complete with alien curtains, on the first floor. The Discover Centre is fully accessible with lift access to all floors. There are baby changing facilities and high chairs in the café. There is a shop on the ground floor selling a carefully selected range of children’s books and related gifts. Discover Children’s Story Centre is located at 383-387 High Street, Stratford, E15 4QZ – around 5 minutes’ walk from Stratford station/Westfield Shopping Centre.